When will we know the Koreans have "arrived"? The track is where a maker -- as much as a driver -- proves its worth. Photo: Denise McCluggage. In the first running of the Indianapolis 500 in 1911 Ray Haroun strapped a mirror in his race car instead of toting the usual swivel-necked riding-mechanic to keep him informed on conditions to the rear. That rear-view mirror found its way into road cars and was about the only thing we could cite as argument that “racing improves the breed”. This was in those mid-century days when our carmakers turned vehemently anti-racing, pulling official participation from NASCAR and forbidding any performance numbers like horsepower to appear in ads. Only comfy-ness and, ooh, rich textures on seats and smiley smiley children with tightly-coifed mothers. Not that improvement of the breed wasn’t something to be wished at that time, particularly by those few of us who had embraced driving as a sport. We were the ones who plastered numbers cut from sticky shelf paper on the sides on our perky little mounts from England, pulled on our knit-back gloves and on weekends cheerfully sped amidst hay bales stacked meanfully on old airports. In post-war years American cars had grown ever more yacht-like, lumbered about on bedspring suspensions and favored interiors upholstered with mouse fur. “Detroit iron” was our disdainful name for these monsters. We favored jolting about in much smaller cars, cars that you donned rather than were swallowed by. Ah yes, many had asthmatic heaters, or none, and sidecurtains that were downright hospitable to rain. But these cars actually stopped within memory of the first application of the brake pedal. They turned corners within then breathtaking inches of where a quick-response steering wheel – the size of a large pizza — bade the skinny tall tires to go. The home-grown puffed-cheek beasts wallowed in the general direction of a chosen course, the steering wheel having required several full turns to influence that choice. The less connection with a road’s surface the more these cars represented Detroit’s intention. The anti-car carmaker ruled. When did all this change? I would say when Detroit lightened up on trying to anticipate what Washington might want of them and began noticing customers in important numbers were being enticed off the farm by foreign cars. And vaguely wondered why. 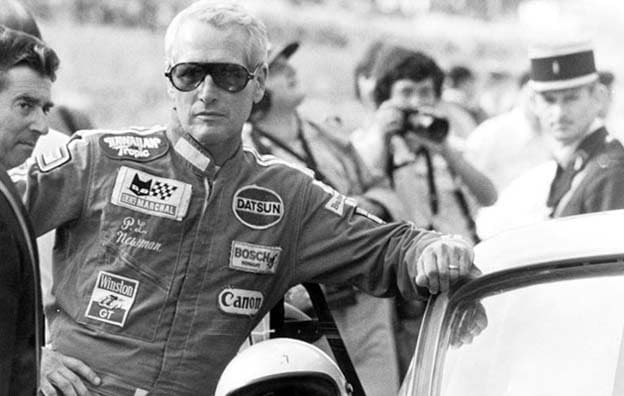 Paul Newman helped prove Datsun - later Nissan - could compete with the best of the breed. And then there was Ford’s great racing effort of the 1960’s which saw a return to NASCAR and the reward of success. And sales. Then came the collaboration with England’s Cosworth that saw Scotsman Jimmy Clark winning Indy in a Lotus painted British-racing-green (green on an oval track!) wearing a Ford Cosworth in its tail (rear-engined race cars!). And then came the intense (and, wow, costly) attack on LeMans climaxing in a Dan Gurney/A.J. Foyt victory in the GT40. Beating Ferraris. And of course there’s Carroll Shelby and his Cobras (and his recent return to the Ford camp.) Hey, how’s that DNA tracking working out for ya? But GM can be awkward at times. Oh my. When tradition in Europe had it that car models were named with racing terms or scenes of successes – Ferrari Mexico, MM for Mille Miglia etc – Pontiac came out with the GTO. GTO was the designation for racing cars homologated in the Grand Touring category. Pontiac did earn the name Bonneville legitimately with speed runs at the Great Salt Lake, but GTO? To them just a nice memory-catching string of initials. I wrote a column, oh those many years ago, berating GM for “bouncing its image off other people’s trophies.” Must have made ‘em feel really bad, ya think? But still I readily accepted Briggs’s offer of a ride in one of his LeMans-bound Corvettes in 1960. Would have loved to have spent my part of 24 hours going as fast as reasonable in one of them, but the powers running LeMans said women were not welcome on their Sarthe circuit. 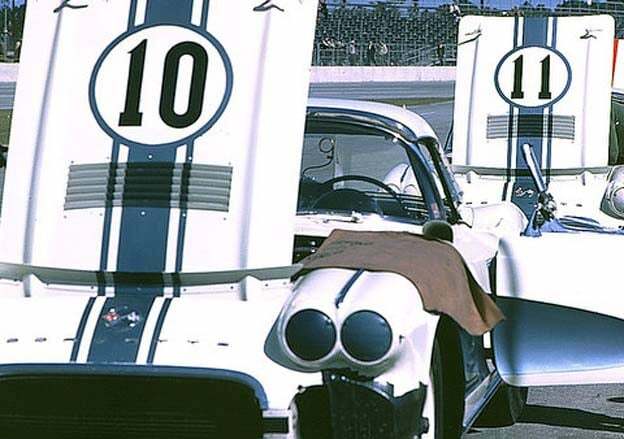 I settled instead with beating a bunch of Corvettes at Sebring the following March in my Ferrari 250 GT. V-12 is always cooler than V8. However in recent years GM has impressed me down to the ground with its Nurburgring and proving ground testing programs. Arduous, expensive and time-consuming. Engineers tweaked and tuned and honed until the Cadillacs were as ripped as a Mr. Universe. Indeed, the entire GM line (or what remains of it) has become taut and rigid and as serious as a three-year-old in a sandbox. Handle? Better believe it. Well-earned DNA. The success of the American invasion by Japanese cars was based originally on lower prices. Then on greater reliability. Just about the time Ford reawakened its racing heritage the Japanese companies saw the need to strengthen their appeal and broaden their authenticity with racing DNA. Hey, when Nissan was still Datsun a singularly famous pair of blue eyes was peering out over a hood with a racing number on it. Paul Newman got acquainted with the Datsun 510 at Bob Bondurant’s school and that was his car of choice when he started racing with intent. He went on to the 240Z and the 280Z. Geoff Brabham, Champion Jack’s eldest, was the name we all associated with Nissan in its racing heyday. Disclaimer: this is not meant to be a detailed history of anybody’s racing effort – just stuff I can pull out of a memory jumbled with engine blips and the sweet smell of Castrol. And I do recall Dan Gurney tossing Toyotas about in the Barry Brown-filmed commercials up Pike’s Peak. This All-American Racer (never mind the irony) ran a strong and successful Toyota team. Much was learned by all. Toyota is in NASCAR now, too. And has won. As for Honda, it started with motorcycles. In the early 1950’s Pop Honda went to the Isle of Man TT and came home with assorted parts weighing him down. And ideas lifting him up. By 1961 the team had won championships in the hard-fought knee-to-the-ground series. So Honda knew that racing would be essential to its automobiles too and its F1 experience has informed innovations in its road cars. There have been Infiniti engines in IRL (even Oldsmobiles) but now it’s the Honda/Indy Car Series. Mazda may be the racing-est marque on the planet. Its name is now attached to the Laguna Seca raceway and more people race Miatas than fleas have circuses. Zoom-zoom is not just for ads. Every Mazda on the market puts performance foremost. Perform or change your name. Zoom. Mitsubishi and Subaru do their DNA enhancement on the World Rally Scene. A testing test bed for certain. That’s enough. Now to what Sam said. Then Sam Mitani (ta-da!) but his finger on it: the Koreans lack the racing heritage that has filled out the physique and the psyche of the admired cars of Europe, Japan and the US. There is on the Chosen peninsula no tradition of motorsports, no Korean drivers ready to make the world scene and the companies, as Sam points out, have not only not produced a car to go racing they have yet to offer world drivers a fair dinkum sports car. Are they ready for that move? Evidence is: evident. Formula 1 made a damp debut there in October of 2010. Sam mentions the Korean-designed and built Oullim Spirra, a mid-engine rear-wheel drive machine which has been called Korea’s first super car. (With a price of some $100,000 to prove it.) Japanese performance cars are said to be seen more and more in Korea but affluence is still more likely to be expressed automotively in European luxury sedans. And in the USA Kia Motosports began a racing program in the Street Tuner class with a colorful Kia Forte Koup. And, voila, at Barber Motorsport Park on April 11, 2011, scored its first trip ever, ever, to Victory Lane. Thus does it begin. The decade of the 1960s was Japan’s time to demonstrate a serious interest in motorsports, a long time after its Tercels and Corollas were as common as Birkenstocks on California soil. Given the increased pace of Korean development maybe the next few years are the Korean “decade” for going after its sporting bona fides. Sam says that path is necessary for us to say not just “the Koreans are coming” but that they have arrived. I’ll rev to that. Yep, improve the breed however you will but this is the truth: racing is the great authenticator. Check out even more from Denise McCluggage. You’ll find her complete collection of McBlogs, photos and more at DeniseMcCluggage.com. This entry was posted on Wednesday, April 13th, 2011 at and is filed under Automobiles. You can follow any responses to this entry through the RSS 2.0 feed. Both comments and pings are currently closed.